Cucumbers are relatives of the gourd. They are cool and juicy and great for summer eating; however, they don’t have a lot of flavor or nutritional value on their own. As you can see from the picture, there are several types. The slicing cucumber, often called the table cucumber is usually served raw in salads, sushi, sandwiches, etc. These are often peeled and seeds removed prior to serving. However, they can also be cooked like zucchini. Pickling cucumbers are usually smaller and have thick, bumpy skins. The lemon cucumber is much less common and can also be pickled. It is sweeter than other types of cucumbers and easier to digest. 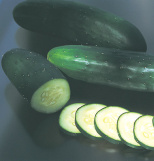 Storing: While supermarket cucumbers are often treated with wax to seal in moisture, those direct from the farm are not. Store farm fresh cucumbers unwashed in your refrigerator crisper, where the higher humidity will keep them crisp. They can be stored for about a week using this method.